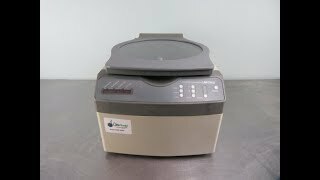 The Labconco CentriVap Vacuum Concentrator built to rapidly concentrate samples through vacuum, heat and centrifugation. Up to 132 samples can be processed on the speedvac concentrator and size of samples can range from microliters, to 25 milliliters depending on the rotor. The Labconco CentriVap Vacuum Concentrator is ideal for Aqueous applications and conveniently fits on most benchtops. A refrigerated cold trap and rotary vacuum pump can be hooked up to the ports of the speedvac concentrator. This Centrivap features a preheat function to bring the chamber to set point temperature, 3 quick access program buttons for frequently used protocols, a corrosion resistant sample chamber, and microprocessor control, with a digital display that shows set temperature, how long the heater has been running and the run time. This Labconco Concentrator also features a quickstop function, upon completion of a run or if the run stop button is activated the system will bring the rotor to a stop. Dimensions (W x D x H) 19 x 14 x 12"
The Labconco CentriVap Vacuum concentrator has been tested on our own house vacuum system and is in excellent working condition. Vacuum pump is not included with this listing. Buyer will need to puchase one separately, as well as cold trap should their application call for one. All of our lab equipment comes backed with our standard warranty. Should you have any questions, please don't hesitate to contact us.